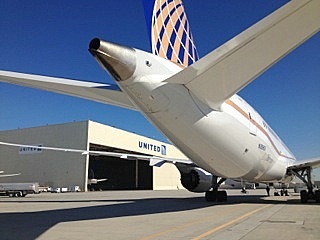 After nine and a half weeks of uncertainty, and with timing appropriate to the Easter season, United Airlines has set the last week of April as the date it anticipates resurrecting the first of its Boeing 787 Dreamliners, then to be equipped with the package of modifications outlined by Boeing in a briefing on March 14th. Employees are being told that the remaining six planes will be modified and begin flying again on a one every seven-to-ten-day schedule, as I reported in today's APEX blog. All of this is, of course, dependent on the Federal Aviation Administration giving its seal of approval to Boeing's system of mitigating the risks of using volatile lithium ion batteries as a backup power source on the airplane. No surprise, the airline is a tad bit nervous about the effect of the interruption in its operation of the world's newest airliner. When flights begin again, United plans to operate the airplane within the confines of the US of A, for - at minimum - four segments before taking the airplane overseas. It will also have a check airman on a minimum of two segments. From airlines like Japan Airlines and All Nippon Airways, which were the first to fly the 787, to LOT and TAM, Qatar and Air India which only had a few weeks to appreciate the airplane before that good girl gone bad, similar reintroduction plans are being made. And no matter how cheery airline executives want to be, (I refer to the most recent endorsement from Etihad's James Hogan who effused to me a few weeks ago, "The 787, it's a great airplane!" - though btw - he doesn't own one yet.) I am confident, many of of those airlines' bosses will be keeping an ear cocked to the National Transportation Safety Board's two-day hearing on April 11 and 12th, into the use of lithium ion batteries in aviation. 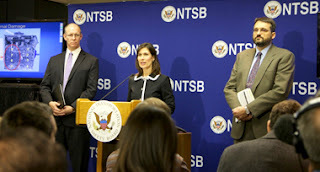 Whatever the US and Japanese safety board's ultimately determine about the cause of those two smoking battery events in January, the airlines flying the 787 have more immediate issues to deal with; how to get their pilots trained, qualified and back into the cockpit and how to re incorporate the planes into flight schedules. In Monday's Flight Global, David Kaminski-Morrow reported Poland's Treasury Minister is estimating Boeing should pay LOT $15 million for the airline's losses due to the Dreamliner. Qatar, Air India and ANA have also indicated they expect Boeing to cough up cash. When asked about Boeing customers at the press conference in Japan on March 14th, Boeing boss Ray Conner said, "The customers across the board have been extremely supportive of what we’re doing. 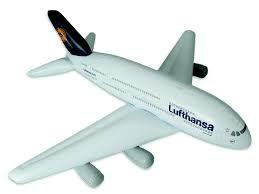 No one has indicated to us any desire to not take their airplanes and they are looking forward to returning to flight." But he dodged specifics by saying compensation was a private matter. It's a safe guess that even the airlines would prefer Boeing to focus attention on getting the airplane back in the air, and leave the compensation calculations for tomorrow. The airlines may be eager to get their 787s back into flight, but for the potential pax it might just be flight. I think I'll let a few million guinea pigs try it out before I'll get on one. It's going to be interesting to see how the various airlines approach re-introducing the Dreamliner into service and it'll be interesting to see the public response to the return to service. I'm a fan of the aircraft (a fan of Boeing in general), but they've not done a lot to impress with this whole debacle, and I don't think their troubles will be over by simply getting the plane back in the air. The next couple weeks / months should be very interesting indeed. Since United seems to be the only US carrier (that I'm aware of -- surely there're more) the choice NOT to fly on a Dreamliner is going to be widely available. I'm wondering if there's a place you can actually go and see the load factors on the redone planes independent of United. I'm willing to bet they'll be flying <50% for a while . . .